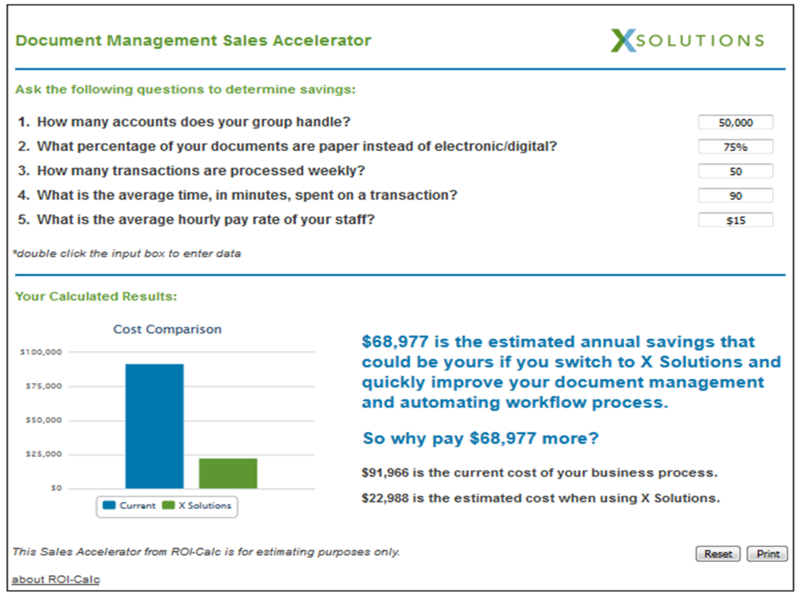 The Sales Accelerator customizes your solution's cost savings, revenue increase, payback and other business calculations to match the prospect’s needs. This easy-to-use software works on all browser supported computers and devices to speed-up the buying process and increase sales the very first day. Asking the right questions is the first major sales hurdle. We will customize your ROI-Calc Sales Accelerator to show the questions you should ask prospects. You need real, actionable information and the Sales Accelerator can display the estimated cost issues of the prospect’s current situation. To get the sale the financial benefit the prospect can receive must personalized. The Sales Accelerator can immediately display the financial benefits so you can share it while talking to the prospect! Our ROI Calculator & Lead Generation Clients Include Startups, Emerging Growth, and the Fortune 500. We have implemented our rapid lead generation and sales acceleration strategies with over 200 companies. We can show you the proven ways to increase sales and profits at the same time. Potential customers want business proof and an easy to understand reason to buy from you or they will go to your competitors. (Click here to calculate your potential sales growth for the next 12 months). We create business analysis tools that you need to increase sales. Info-Tech Research Group found 90% of decision makers require a financial analysis (ROI) and 70% expect the seller to provide the ROI as part of the sales process. Most of your customers don't have either the knowledge or the time to do the ROI analysis so they buy from the companies that will calculate it for them. Don't let your competitors call us first. “Our TCO Analyzer tool has contributed to the successful outcome of hundreds of sales campaigns. It's easy-to-use and is supported with customer responsiveness that is quite frankly, unparalleled."